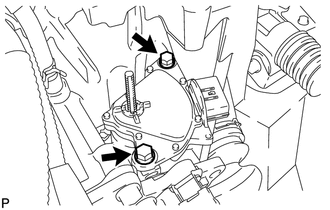 (a) Move the shift lever to N.
(b) Align the protrusions of the park/neutral position switch. 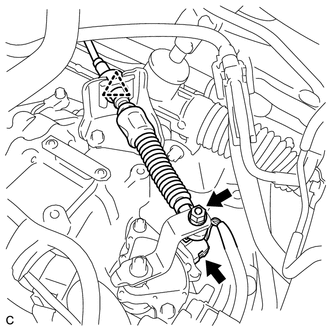 (c) Install the park/neutral position switch to the control shaft with the 2 bolts. Before installing the park/neutral position switch, remove any dirt or rust on the installation portion of the control shaft. Be sure to install the switch straight along the shaft while being careful not to deform the plate spring that supports the shaft. 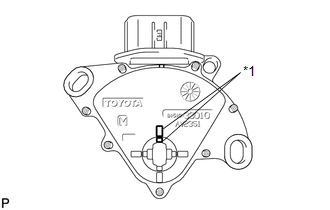 If the plate spring is deformed, the park/neutral position switch cannot be reinstalled correctly. After installing the park/neutral position switch, confirm that the 2 protrusions on the switch are aligned. (d) Install the transmission control shaft lever to the control shaft with the nut and washer. (e) Connect the connector to the park/neutral position switch. (f) Connect the transmission control cable to the transmission control cable bracket with a new clip. (g) Connect the transmission control cable to the transmission control shaft lever with the nut. 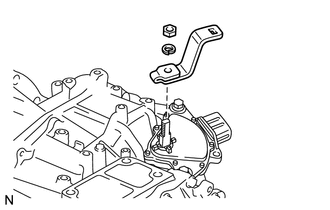 (a) Install the air cleaner bracket with the 3 bolts. 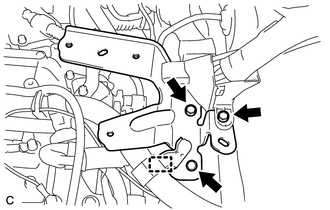 (b) Install the wire harness clamp.